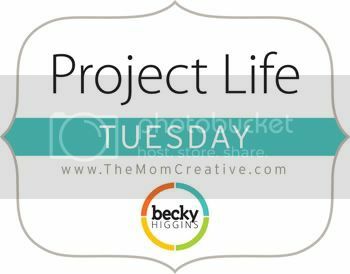 Welcome to Project Life Tuesday, Week Nine. 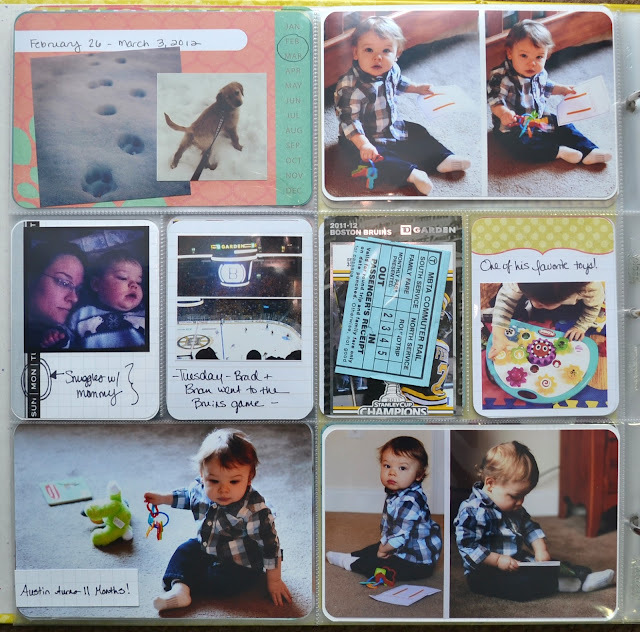 This week was really photo heavy, so instead of regular journaling I opted to just put little "titles" near my photos. 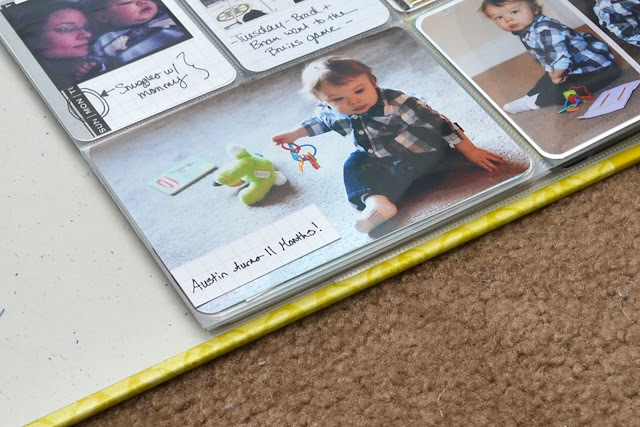 I had a ton of Instagram photos, some memorabilia to include, and Austin's 11 month photos. My apologies for the reflection from the flash - I had to take the pictures at night this week. I included the ticket stub and train ticket from the Bruins' game that Brad and my brother went to on Tuesday. Also inserted behind these two cards are some free trading cards that were handed out at the game. I used a couple of sheets of grid paper that I'd printed myself to cut little labels for a few of the photos. 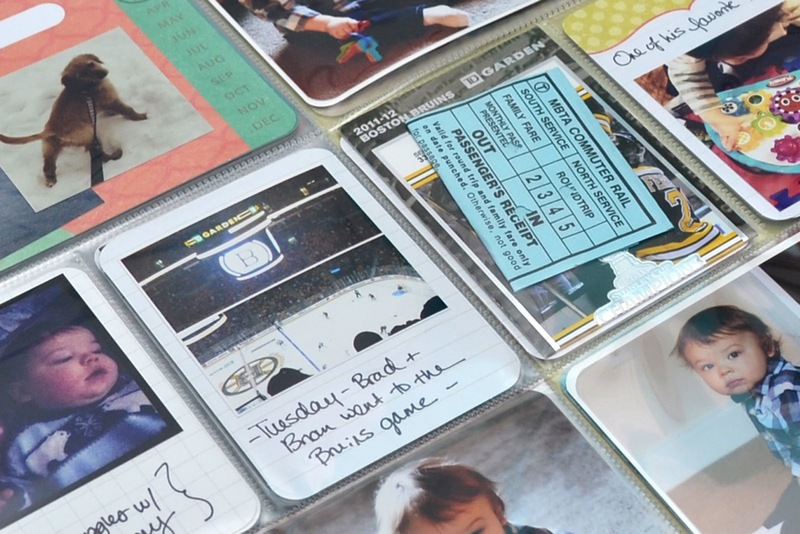 I stuck these on top of the page protectors, because I didn't want to damage the original photo. 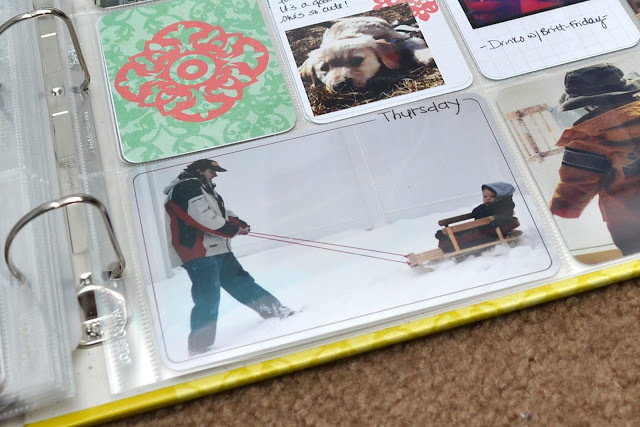 Finally, I used one of my own overlays on the sledding picture. And that was the week! 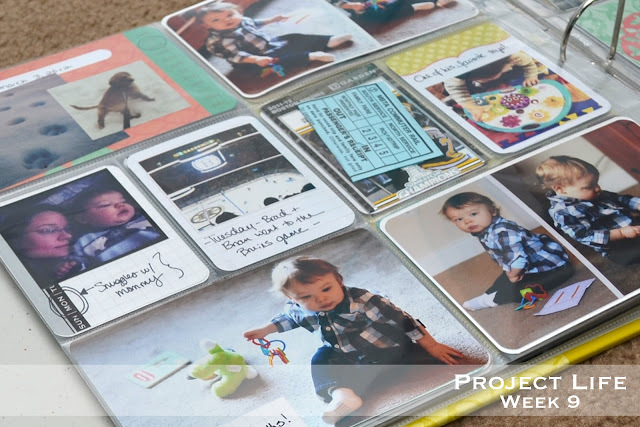 Be sure to stop by The Mom Creative and check out everyone else's layouts! 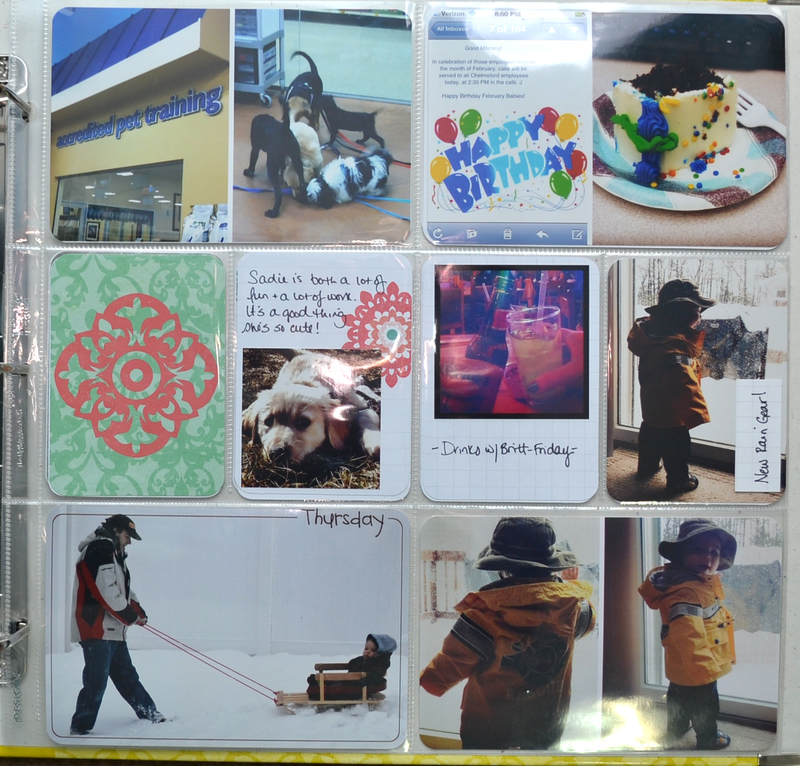 I love the look with lots of photos. Really nice pages! Great job! Love how you add the instagrams throughout! Great pages--love the dog tracks in the snow. I miss the snow! Must head to the mountains soon. 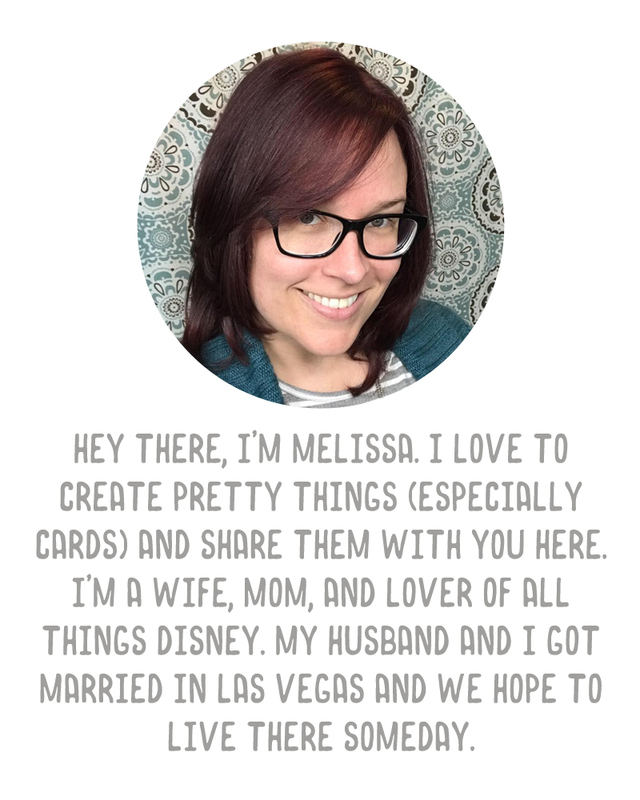 LOve your pages!! The snow looks so fun...I think I miss it sometimes..LOL..I grew up in Maine and now live in Arizonia...Love the doggy prints!! Looks like agreat week!. I've been doing a lot of journaling on top of my pictures, too. I am surprised each week at how many pictures I'm taking - having the iPhone makes a huge difference. Love your pages. beautiful! love how you journal on top of the photos! fab pages, really inspiring. thanks! Such a cute puppy! Pages look great!